It’s a great week for a Star Wars movie, isn’t it? The weather is cooling down, the clouds are pushing away, the Death Star is coming into view. 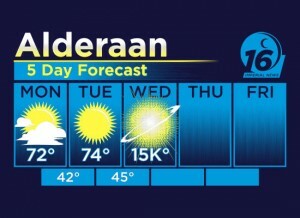 There’s no way this could ever go badly for us here on Alderaan. We’re all set to see all the new movies coming out on Thursday and, in rare cases, Wednesday evening. See, the Death Star is here to make sure nothing happens to us before then. Right? Right?? Right. Yeah. May the Force be with you, Death Star!